Mother board – fits all connectors on the rear panel, power supply, I/O controller (second CPU) intended to be a chassis for all RF boards and options, as long as “cable harness” and board interconnections. 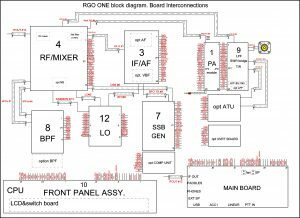 RF mixer board – RX/TX switching, receiver front end, first RX mixer, TX mixer, first roofing crystal filter, ALC circuit. Noise blanker (option). SSB monitor amplifier. 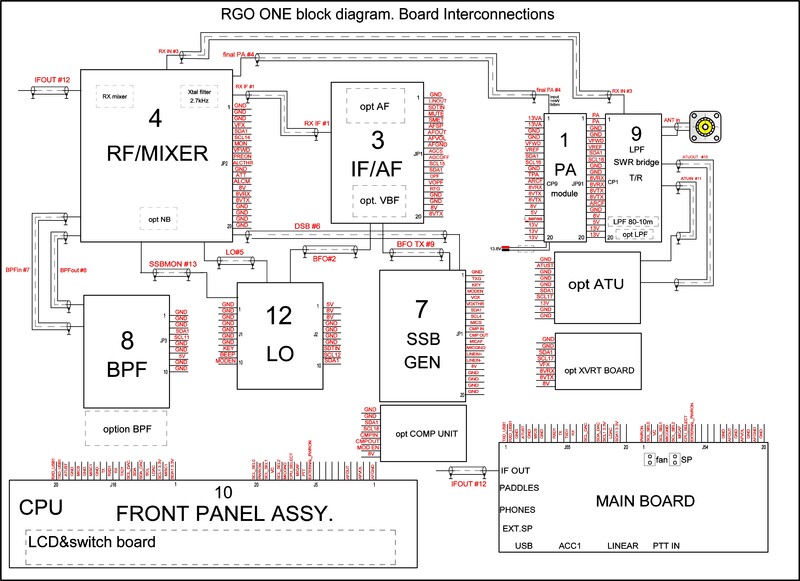 SSB GEN board – forms both CW and SSB signals, microphone amplifier, compressor unit (option, Line in/Mic in circuit. LO board – local oscillators, side tone and beep tone oscillator. First oscillator and BFO oscillator. SSB monitor .